For example, when you’re considering applying or replacing a Brand, the tooltip for the new brand will indicate if the requirements are meant or not with green checkmarks or red x marks. If one or more requirements are not meant. 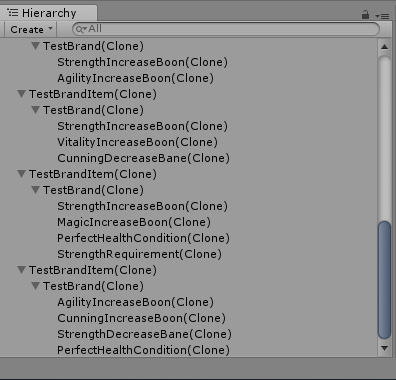 the effects will be greyed out to help underline the fact. 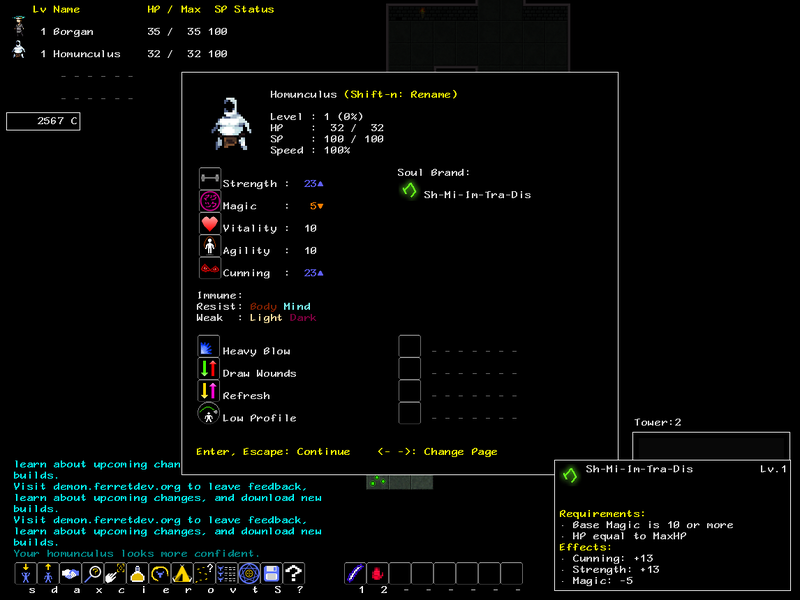 In character sheets and party views, brands that are equipped but cannot be used are colored yellow as well. Not a super exciting update, I know, but getting close to being ready to show some usage of Brands by AIs, which should be more interesting… well, if I can find an effective way to show it in a blog post. Nothing too exciting in these, but I wanted to show what I’ve been making progress on recently. 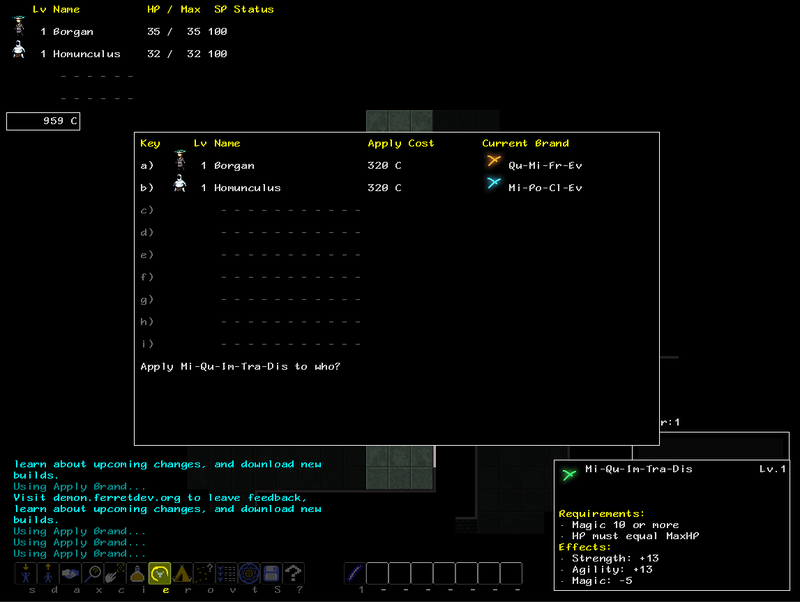 New features mean new UI, and usually lots of it. In addition to UI, I’ve also gotten most of the saving/loading related to Brands working, but that’s a bit difficult to show with screenshots. Getting a bit closer… but still a ways to go. 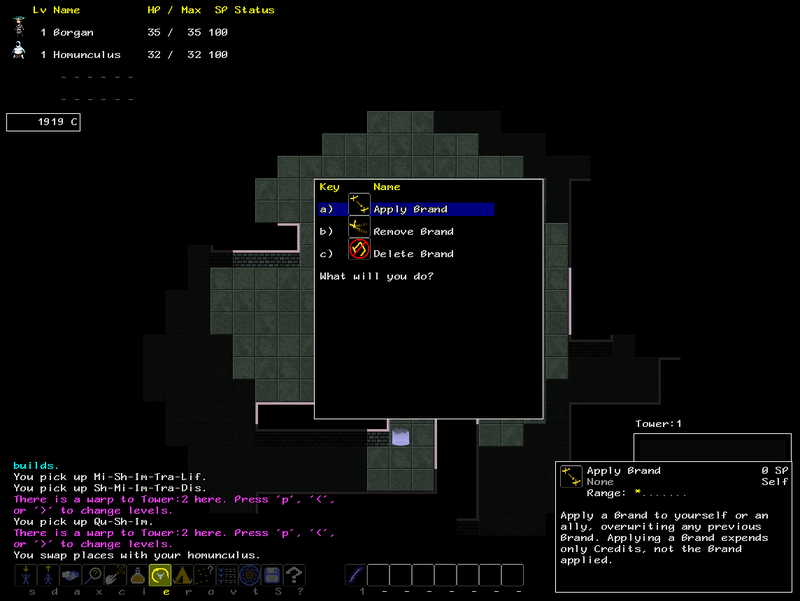 As previews go, this won’t be much, but I wanted to show at least *some* kind of progress. 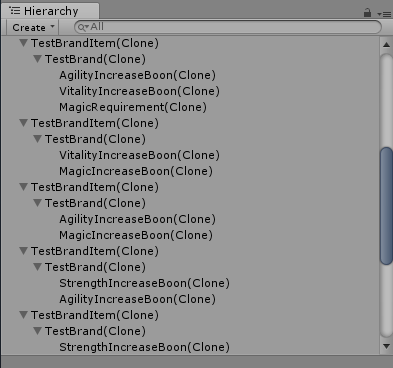 Up to this point, I’ve been working on the base system for generating random Brands. 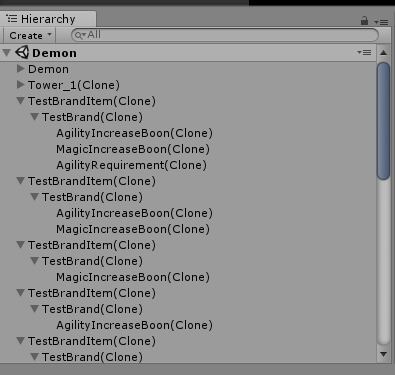 Happily, that system is now working enough where I can show you some of the Brands it is generating. 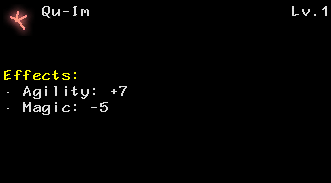 I should stress: I have only made a VERY limited number of possible boons, banes, conditions, and requirements up to this point. It’s generally a bad idea to go making a lot of content for a system until the system’s complete and has been tested: otherwise, you risk finding out you need to change something about how you made your content, and now you have a ton of content to redo instead of a little. But, even with only that very limited number, you can start to see some at least slightly interesting results. 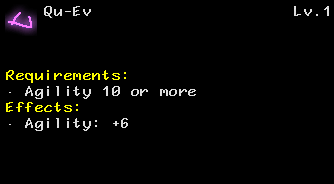 1st: Requires Agility, then boosts Agility and Magic if the requirement is met. 2nd: Just raises Agility and Magic straight up. Notably, the bonuses would be less than the 1st since there’s no Agility requirement. 3rd: Only a Magic boost here. It would be more of a Magic boost than the 2nd however, since it isn’t also boosting Agility. 4th: Only an Agility Boost. Like the 3rd, it’d be a better boost than the 2nd since it’s just the one stat. 1st: Requires Magic, but boosts Agility and Vitality. Good defensive boost for your magic users. 2nd: Simple increase to Vitality and Magic. 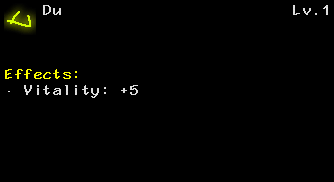 3rd: Simple increase to Agility and Magic. 4th: Simple increase to Strength and Agility. It’s worth noting that Banes, Conditions, and Restrictions are, at least currently, somewhat rarer than Boons, but that could very easily change before release. Last set of 3 (ignore the topmost one, it was in the 2nd set), and it’s here the RNG decided to make things a bit more interesting. 1st: Increases Strength and Vitality, but decreases Cunning. Could be a good defensive or melee boost for any character not planning to use status effects. 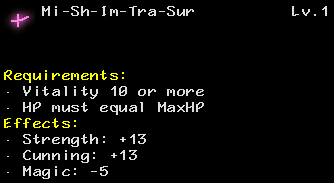 2nd: Now we have a tricky one: Requires Strength, and only functions when HP = MaxHP, but increases Strength and Magic. The bonuses to Strength and Magic granted however, would be considerable due to the present of both a requirement and a condition. A little unfortunate it is Strength + Magic as the bonus pair, since that usually requires melee to take full advantage of, an obvious problem with HP = MaxHP as a condition… but the size of the bonuses might be worth trying to find a way to make it work. 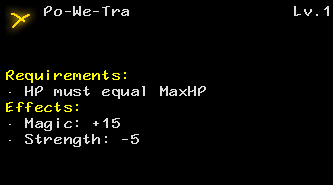 3rd: Another tricky one: When HP = MaxHP, it raises Agility and Cunning while decreasing Strength. As with the 2nd Brand, the bonuses will be considerable since both a bane and dondition are present. 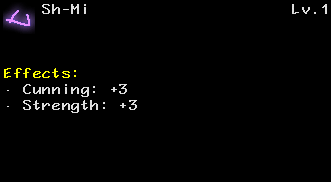 Seems ideal for a character who uses ranged attacks to inflict status conditions and isn’t quite as concerned with the damage. 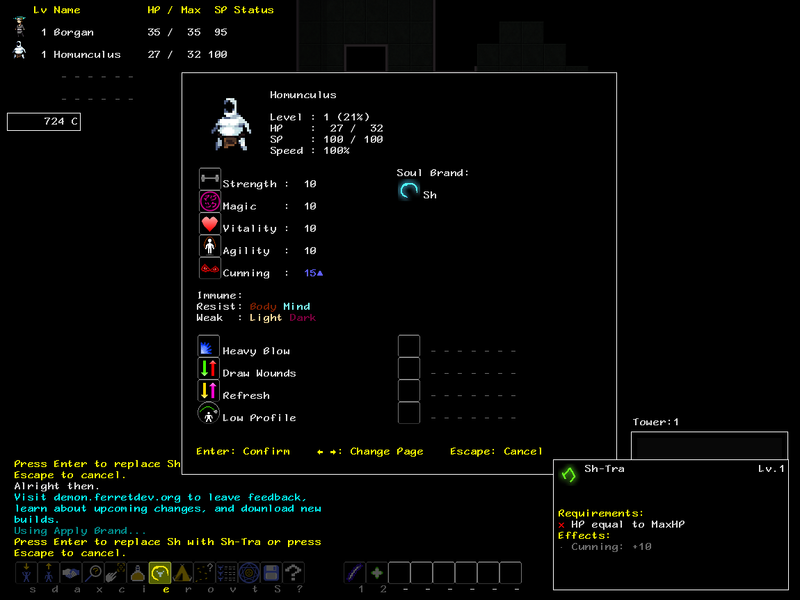 I should stress again: this is nowhere near the complete set of modifiers I plan on supporting in the release, just a test set that is enough to run the system through its first paces with. That said, I think even with this incredibly limited set there are some interesting results coming up. I can’t wait to see what sort of things pop out once I’m further along. Not much of an update, but I try not to go too long without posting. Still here, still working on Brands, not quite ready to show yet.